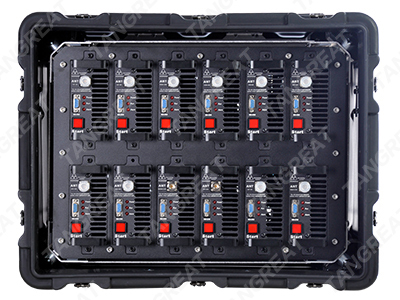 WF-12 JAM is a High Power DDS Convoy Jamming System, implementing the most effective and reliable RF jamming technology and equipped with a fully-integrated broadband jamming system. ● Designed with ultra broadband frequency bands, 20MHz-3600MHz (20-6000MHz). ● 12 modules plug and play design, facilitate for future power upgrading, change and maintenance. Any ruin on the modules never interfere the normal operating of other modules. ● American Mil-spec standard case, shockproof and drop-resistance, available for the vehicle running in a worse field environment. ● Up to 20 Frequency Bands. 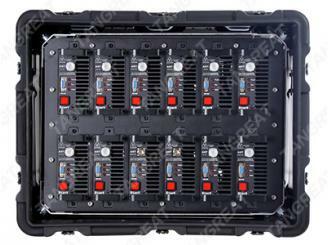 All Jamming Modules Designed by DDS technology. ● Operators are able to regulate the working frequency band and output power of each module through the software. Configuring a specific frequency band can ensure the internal communication in emergency. ● System operation can be performed in the driver’s console unit. Each module can be ON/OFF. Backup battery or generator system can be optional. ● Device body is no more than 90kg. ● Continuously and simultaneously interference to the common used RF signals. ● Equipped with high power generator to ensure excellent low noise operational capabilities. 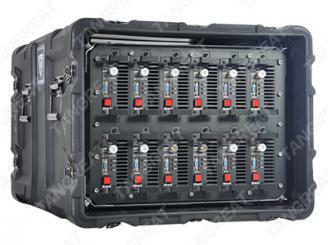 ● Integrated backup battery system for continuous silent operation and fast start. ● Integrated smart active cooling system to make sure the device working continuously. ● Antenna is installed with a covert design. Protecting military and VIP convoys from the threat of Remote Control Improvised Explosive Devices (RCIEDs)-road-side bombs has become a challenge and task in many parts of the world. Tangreat solutions—WF-D12 JAM, High Power DDS Convoy Jamming System, implementing the most effective and reliable RF jamming technology and equipped with a fully-integrated broadband jamming system. WF-D12 JAM can cover, continuously and simultaneously, all the RF communication Frequencies 20MHz~3600MHz (20-6000MHz) which are most commonly used by terrorists to detonate road-side bombs (RCIEDs).Adopting the latest jamming technologies, WF-D12 JAM features ultra-high RF transmission power of 1300 watt, making a bigger shielding range around the vehicle. 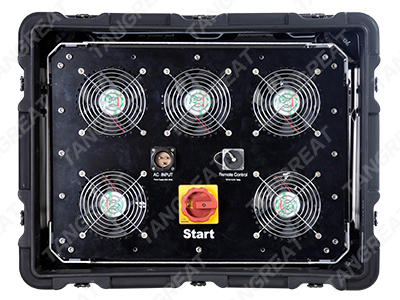 Beyond the installation of the convoy protection device itself, the vehicle is customized with special RF protection for full protection of the driver and passengers.System management, including activation and controland operation is carried out through a wired remote control unit installed covertly inside the driver’s console unit. Once the system is activated, it transmits unique noise signal which creates "Firewall" between the transmitter (terrorist) and its receiver (explosive device). Effective eighteen-month warranty and technical support is absolutely indispensable to make sure our excellent quality and reputation. There is absolutely no better way to defend your VIP from the threat of radio-activated bombs. Protect military and VIP team from the road-side remote improvised explosive device (RCIED) attack detonated by the terrorists. Moreover, It can prevent terrorists using GPS location to track the vehicles efficiently. Used for EOD. Before EOD, wireless telecommunication signals surrounding the bomb must be blocked effectively to prevent the terrorists detonating the the bomb through the wireless remote control devices and avoid the huge casualties. It can be applied that the common used telecommunication frequency will be blocked when the Police arrest the criminals in order to prevent the criminals gang or Police insider leaking the confidence through the wireless equipments ,so that the arrest collapsed. It also make the criminals not be able to remotely control the bomb in the key entrance of the building so that Police can quickly access to the building and round up the criminals to avoid the casualties. Protecting the boarder and army patrol from the attack of road- side bomb RCIED denotated by the terrorists. It can be used to prevent terrorists remotely controlling the bomb bursting points in military protection zone,government buildings and some other important places. It can also make the criminals hidden in the military protection zone not communicate with the outside gang to leak the confidence. In the event of the partial ground war, this wireless jamming system can prevent the enemy laying the bomb denotated by the wireless remote control in advance. In order to protect the land surface chariot attacking troops, tank and soldiers’ lives. It can also fixed in some occasions for a temporary protection to respond to some emergencies. Back to Vehicular Bomb Jamming for more choices. Bomb disposal squads, VIP protection, military security forces, anti-terrorism units, anti-drug units, Border control units, checkpoint personnel, etc, such types of law enforcement personnel who benefit greatly from the deployment of any of these best-in-class portable RF jamming solutions. They can conduct the law enforcement process more effectively to reduce the chance that the criminals leak the information. And some important sport events, international summits, and so on. Note:All Bomb Jammers, IED Jammers,RF Signal Jammer and RCIED Jammers, including cell phone jammers and mobile phone jamming devices are sold for governmental, law enforcement and military users only.